Friday evening, and nearly everyone was in a hurry to get home. 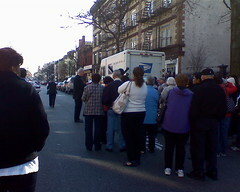 But on Brooklyn’s busy Court Street, traffic was at a standstill. Horns were honking. Angry drivers were leaning out their windows, shaking their fists, demanding to know what was going on — was it an accident? A disaster? A drill? 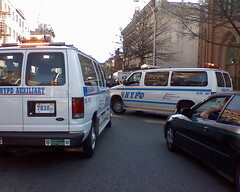 What could possibly be so important that it caused the police to close the roadway at rush hour? 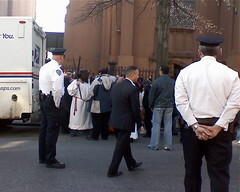 I walked past the stalled cars and trucks, beyond the police vehicles and uniformed officers that blocked the street, and saw the center of the commotion: a Good Friday procession assembling outside the oddly named Saints Peter & Paul & Our Lady of Pilar Church at Congress and Court Streets. I didn’t have time to pause and hear a full explanation, and the only camera I had with me was in my phone. If you know more about this event, or this church, please share the story. 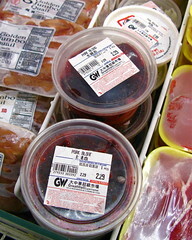 Great Wall is the largest Asian supermarket chain in the Eastern United States, with branches in Georgia, Massachusetts, New Jersey, New York and Virgina. Styled after major American food chains, Great Wall offers locally-produced groceries as well as those imported from all over Asia, with an emphasis on freshness, cleanliness and customer service. These stores combine many of the features of traditional Asian markets (seasonal produce, medicinal herbs, live fish swimming in tanks, butchers ready to cut meat to order) with American tastings, discount cards, weekly circulars and sales. There are always some things, however, that may seem strange to Westerners. 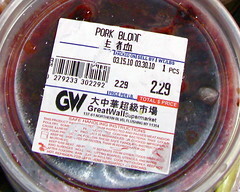 I found this item in a refrigerated case at the Great Wall store on Northern Boulevard in Flushing. 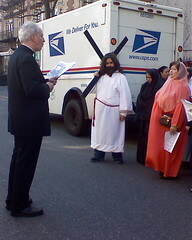 You are currently browsing the Blather From Brooklyn blog archives for April, 2010.